With advancements in veterinary care, senior horses are now living longer than ever. Let’s explore three key areas to focus on to help keep aging equines healthy and happy well into their 20s and beyond: fitness, veterinary care, and dentition and diet. Like their human counterparts, horses are individuals—they don’t all age in the same way nor at the same rate. It is not uncommon to see horses in their late teens and even early 20s performing at high levels. While most senior horses may not compete at an elite level, a structured fitness program will keep their joints and surrounding soft tissues healthier. Be sure to provide regular, consistent work. Inconsistent exercise may lead to discomfort and injury and rebuilding muscle, flexibility, and stamina takes longer and longer as time goes by. However, aerobic performance decreases as horses age and they become less efficient at regulating their body temperature, so be careful when exercising seniors in hot, humid weather. Some seniors have good and bad days, so it is important to pay attention and adjust your plans when necessary. For example, those with arthritis will likely need a longer period of time to warm up. Additionally, tripping or loss of balance could indicate that they are having trouble with their conditioning program. Aging horses should have particular attention paid to their nutritional needs. Proper protein and fiber intake are imperative for horses, as they often suffer from inefficient digestive systems and may also require a special diet. Furthermore, horses that leave food in their buckets might need a diet change or to have their food processed into a mash to make nutrients more accessible and prevent choking. However, be sure to have their teeth checked before making any changes, as dropping food, weight loss, and a loss of appetite can be signs of dental problems as opposed to digestive issues. Routine dental checks—at least once a year—will help prevent these concerns. In addition, note how mature horses maintain body weight and condition in the extreme temperatures of winter and summer. These severe differences may necessitate the addition of calories to their diets. 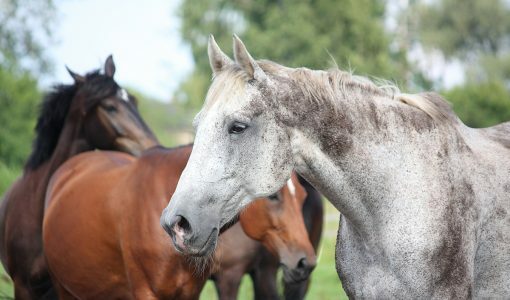 Older horses should have regular visits from a veterinarian, as frequent, basic musculoskeletal system examinations can help address issues before they become substantial problems. The cardiovascular and endocrine systems should be checked as well. The risk of heart valve disease and murmurs increase as horses get older, so have your veterinarian listen to the heart twice a year during vaccines so that they may pick up on any changes. And, be on the lookout for sudden weight loss and change in coat condition, as metabolic concerns grow as horses age. To help monitor normal vitals and stats and any changes that may occur, have a stall card with important information readily available. Be sure to continue routine vaccinations as well—older horses’ ability to respond to infection or disease decreases over time. 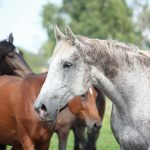 While many seniors may not travel off-grounds often, if new horses come into the barn they can be exposed to pathogens. Take additional precautions such A quarantining, and never share equipment such as water buckets, tack, or blankets. Finally, don’t forget to give senior horses endless affection and praise for everything that makes them so extraordinary!